Joint List MKs offer support for Hezbollah, condemn Saudi Arabia, Gulf Arab states following terror listing. Knesset members representing the Arab Joint List party issued a formal condemnation on Monday of the decision by a number of Arab states labeling Hezbollah a terrorist organization. Last week, the Gulf Cooperation Council, which represents Saudi Arabia, Bahrain, Kuwait, Qatar, the United Arab Emirates, and Oman voted to recognize the radical Iran-proxy Shi’ite organization as a terrorist group, joining the United States, France, and Canada among others in labeling Hezbollah a terrorist organization. Hezbollah, which enjoys representation in the Lebanese parliament, has organized terror attacks against not only Israel, but Western powers including the massive 1983 Beirut barracks bombing, which left more than 300 dead, including hundreds of US Marines and dozens of French soldiers. The Joint List, however, rejected the designation of Hezbollah as a terror group, blasting the decision as an endorsement of the “occupation" and claiming that it "could serve Israel's interests". Ignoring the organization’s history, the Joint List asserted there were no grounds to condemn Hezbollah. 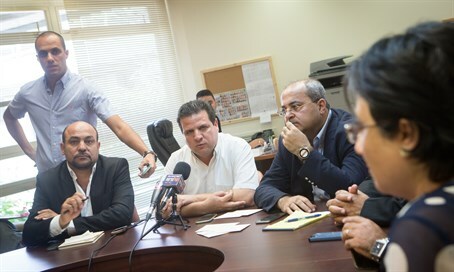 Transportation Minister Yisrael Katz (Likud) responded to the Joint List's condemnation saying "It's simply unbelievable that Knesset members would harm Israel's interests." Katz blasted the Joint List's leadership, drawing parallels to disgraced former MK Azmi Bishara. Bishara, the founder of the Balad faction currently within the Joint List, fled Israel in 2007 after it was revealed he had provided technical support to Hezbollah during the 2006 war with Lebanon, when he guided its missiles to hit Israeli civilians. "Ayman Odeh and Jamal Zahalka, go join Azmi Bishara in Qatar or Syria - that's the place for traitors to our country."